Happy Birthday Jilly-Bean! 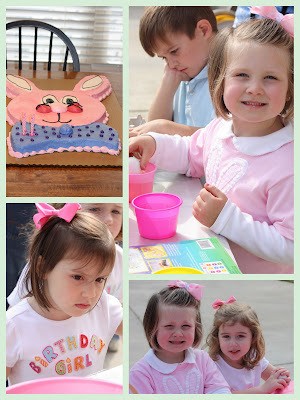 Brylee's friend Jill had an Easter Birthday Party this afternoon. All the kids dyed Easter Eggs, hunted Easter Eggs, and ate hot dogs and cake. It was a fun time. The party and Jackson's baseball game were around the same time. So brylee and I went to the party and then we were going to have to leave early to go to Jackson's game but thanks to Mrs. Pandi and Mr. Mac (daughter coleigh pictures with brylee in the bottom right.... AOPi Pandi for all you UAB reader or stalkers.... j/k love you heather thanks for reading :)) who offered to watch Brylee and then bring her to the ball park when the party was over. Brylee's was beyond excited to be able to stay and not have to spend more time at the ball park. Fun Times!